As we've covered in many AutoSpeed articles, there's now a huge variety of used cars available at very low dollars. Turbocharged, hi-po four-wheel drive, V8 - even the performance luxury cars of yesteryear are now within easy reach. 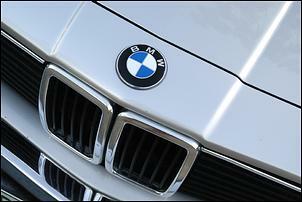 Cars like the BMW 735i, for example. Regarded as one of the best sporting limousines in the world when it was released, these days you can pick one up for around AUD$5000. Yes, five grand for an all-leather, all-electric prestige German with ABS'd four-wheel ventilated discs, an 150kW in-line EFI six, four-speed auto and roadholding and ride comfort which compares well to even today's new cars. So what's the catch? Well, of course there are some. The steering is vague, the body shape old and unaerodynamic. The seats are rather hard - but we're getting ahead of ourselves. The 7-series represented a major upgrade for the marque. The successor to the 2500/2800/3.0/3.3 litre E3 cars (which these days are almost forgotten), the Seven was BMW's modern coming of age in prestige performance. After the lean years of the Fifties and early Sixties, then the success - primarily with small cars - in the late Sixties and mid-Seventies, the BMW 733i clearly showed that BMW wanted to take it right up to the dominating Mercedes. In many ways it followed the new BMW look established by the 3 and 5 series, but the 7 was a long way upmarket, especially in the cabin equipment level. However, many commentators suggest that it took five years before the model reached full potential. The 733i was released in Australia in March, 1978 with a 3.2-litre in-line SOHC six cylinder developing 145kW at 5500 rpm and 280Nm at 4300. 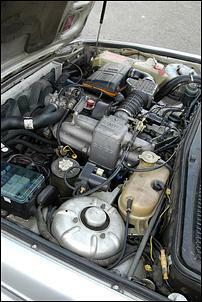 Much the same engine had been used in the last of the earlier series (specifically the 3.0si and 3.3Li) and many of the other mechanical ingredients were either direct carryovers or modelled closely on the previous cars. The transmission was the old 3-speed auto but the body and interior were all-new. At around 1500kg (depending on the model) the 7-series was, in modern terms, quite a light car for its size. In Australia the car was greeted with a mixture of praise and criticism - praise for the execution of the mechanicals and interior, criticism for the way in which on other than smooth roads it didn't quite live up to its publicity. Incredibly high tech in its interior, the reviewers were confronted with so many ideas they regarded as overkill they had a hard time separating what was good and what wasn't. 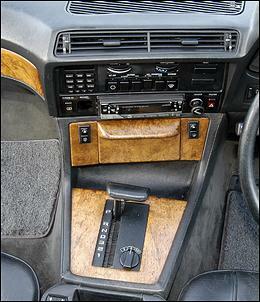 The radio included shortwave and a 'dictaphone' function; the check panel (it used a display to show whether the brake lights - and many other functions - were performing correctly); the instrumentation and controls angled towards the driver so much that front seats passengers complained of being excluded; the dashboard lighting even outlined the cigarette lighter. History allows us to assess what were interior breakthroughs (the check panel) and what were dead-ends (the dictaphone). But at a price of AUD$38,145 (nearly six times a full-size Holden, which would make it about AUD$190,000 today), the basics of performance (quarter mile, 17.4 seconds) and ride and handling on our indifferent roads didn't quite live up to the hype. August 1982 saw the launch of a facelifted model. Still with the same 3.2-litre engine, the new car added a full-function trip computer, a service indicator, cruise control and climate control. However, this model tested at 17.7 seconds for the standing 400 metres - perhaps the extra weight of all those gadgets was starting to slow it down... Heavier anti-roll bars were fitted and the angle of the rear suspension trailing arms was altered from 20 to 13 degrees. The specification list also showed for the first time something modern-day buyers should take into account: metric wheels. Yes, instead of having 14 or 15 inch wheels, the 733i was available with Michelin TRX 390 alloys - that's 390mm or 15.35 inches in diameter. Tyres are still available in this size, but they're priced at so high a level that many people have gone back to conventional 'inch' wheels for their BMWs. 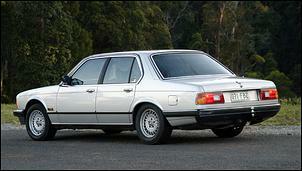 The 735i arrived in Australia May 1983. The badge may have implied a 3.5-litre engine, but the swept volume was actually the same old 3.2 litres! However, the 735i got some major upgrades - the four-speed automatic (a ZF 4HP22) and electric seats amongst them. However, again the suspension was criticised as being more appropriate for smooth roads. And for the first time, it was suggested that the steering was rather old-fashioned - probably the most glaring deficiency when the car is analysed today. With four turns lock to lock and a large diameter steering wheel, the 735i feels vastly more ponderous than it really is. However the engine, despite being largely unchanged for many years, continued to attract praise for its smoothness and power. 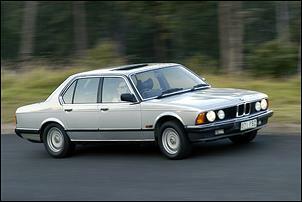 The last of the E23 735i models was released in mid-1985. The engine size now nearly agreed with the badge - it was 3430cc. Power rose from 145 to 150kW, with torque more significantly increased, moving from 285Nm at 4300 rpm to 310Nm at 4000 rpm. There were two models available - the Executive (strangely, it was debadged) and the 'base' model. The base missed out on the trip computer, electric seats, Buffalo leather, sunroof and electronic control of the auto. However, both models featured ABS, alloy wheels, analog instant fuel consumption readout and check panel. Performance recorded in contemporary road tests included a 0-100 in 9.3 seconds and a standing quarter mile in 16.6 seconds. 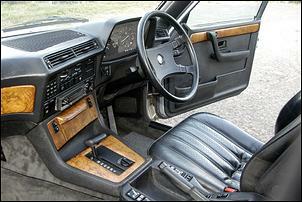 Shown here is a 735i Executive, built in June 1985. As the last of that first generation it's a mix of mid-Seventies design (the recirculating ball steering is vague and the body has plenty of wind noise) and continually upgraded technology, especially inside the cabin. The trip computer looks up to date, the electric driver's seat has memories, and the auto trans has sports, manual and economy modes. At low revs the engine has more NVH than even a base model current Commodore, but the sweet six also comes onto cam at about 4000 rpm and spins superbly to the 6250 rpm redline - something that no Commodore six does! The handling - yes even on rough roads - doesn't really reflect those criticisms made over the years. It's not perfect - with its strange corkscrewing motion over big cornering waves - but otherwise it's a car that leans quite a lot.... then grips and grips. The hydraulically-assisted brakes need a hefty push and the steering (once you get it off-centre) is also relatively heavy for a power system, but the car is cohesive and feels well-sorted when being punted fast. And it has character - character in spades. The front-opening bonnet, the way in which in later models the rear seat electrically reclines (yep, the rear seat...), the odd visual mixture of a chrome handle to release the steering wheel for reach adjustment, and nearby a complex backlit LCD trip computer. But it's also a car that is complex and difficult to fix - not so much in the driveline mechanicals, where the SOHC straight six and 4-speed auto are these days rather simple. But with the complexity of the vacuum-actuator climate control system and interior electronic gadgets, paying someone an hourly rate to work on these wouldn't be an attractive proposition. The chain-driven overhead cam engine runs forever (although it can get a bit noisy in the top end) and there are ready sources of non-genuine spare parts - as you'd expect, especially in Europe and the US and easily available over the web. Rust can be a problem in early cars but the later ones were much better - still, before buying it pays to make a detailed inspection looking for body rot.